On Valentine’s Day while Kimberly was at the doctor’s, I stomped my heart out on our front lawn to surprise her. It was spontaneous, with little forethought, because I love my wife and want to express it, but when I am bowed down with depression, my energy is used up on today’s survival, not tomorrow’s plans. This is how depression often plays out in a committed relationship–with what little energy we have, we give, and we appreciate the gift, however small. It may look meager and haphazard, and to be honest, sometimes it feels that way, but in a cold world with thin blankets what we need most is a close friend. The substructure of our relationship is good, very good, but the frills are often missing. Far from being a problem, this is a sign of our marriage’s strength. Many couples count on the frills to smooth over their stresses. To mollify an angry outburst, he brings home a bouquet or she whips up a banquet instead of sorting through their feelings with empathy and honesty. They’ve tried that and it doesn’t work. They begin with “Let me be honest,” and it goes downhill from there. So they opt for the smooth-over. But when frills become the primary language of love, flubbing it can threaten the relationship. Depression strips Kimberly and me of many of these emotional bonuses, so we cannot use them as a substitute for the honest, hard work of sorting out our differing views, feelings, and thoughts. Of necessity we learn to make room for one another’s weaknesses and limitations, trust one another’s hearts, accept one another’s efforts. Without frills to fall back on, our relationship becomes deeply grounded, and our small offerings of love become far more meaningful. 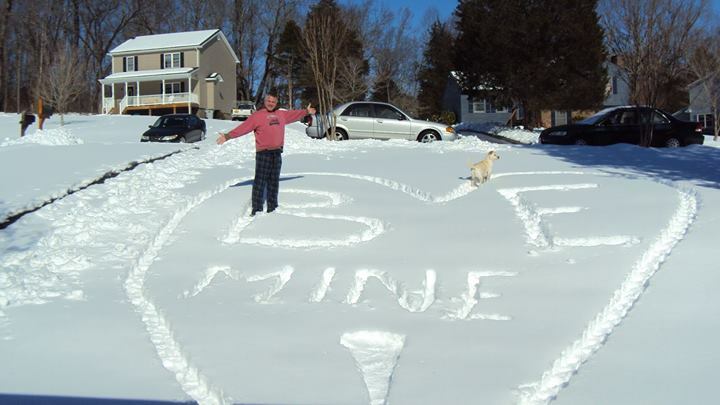 The first thing Kimberly saw each morning as she left for work last week was the heart I stamped out in the snow. And for her it was not just a romantic gesture, but a symbol for what beats behind the image, a heart she knows intimately and feels safe in because she courageously shares her true self and is embraced for who she is. Hallmark and Whitman’s can never compete with that. What a beautiful expression of love. Hey, good to find sonoeme who agrees with me. GMTA. Wow, that was awesome Kent! You totally must get some of this published! You are such a insightful writer and put the best words to so many issues that most people would never even think about! Kimberly is fortunate to have you and I am sure you are also fortunate to have her. It makes me sad that you still suffer so much from depression. I still believe in the power of medications and a good psychiatrist that knows how to prescribe them. Going down that dark hole is something i hope to never do again. My husband was awesome to me when it did occur though. I am very blessed in that respect. He tried cheering me up with the traditional things (flowers, candy, clothes, fancy dinner, etc). What helped me most was for him to just be there with me. Knowing that someone is really there for you in the good and the bad is what marriage is all about. I only hope I can be as good to him if he ever hits the bottom like I did. Praise God, I am doing well now. Take care my friend! Thank you for your kind, encouraging words, Susan. You have a gift for encouragement. I also am glad you are doing well. I have tried two different meds and they didn’t help, which suggests that if my problem is biological (and if meds can help) it will take a great deal of experimentation to find the right med and dose, with regular visits to a psychiatrist. I currently have no health insurance. I plan to sign up for it under the Affordable Care Act, but whether that will provide enough financial leverage I will have to see. And in the end I don’t know if it would help. Thank you for your concern.